How many Earth-like planets are there in the universe? In other words: how many doubles does our beautiful water world have? We’ll never get anywhere near an exact answer but “very, very much” is, most likely, pretty close to the truth. There are about 200 billion stars in our own galaxy. The number of galaxies in the universe is, coincidentally, also around 200 billion. So we are talking about roughly 40,000,000,000,000,000,000,000 stars. Even if only one in a million stars has an Earth-like planet orbiting around it, which seems like a pessimistic estimate, we still have an unimaginable number of twin-earths. 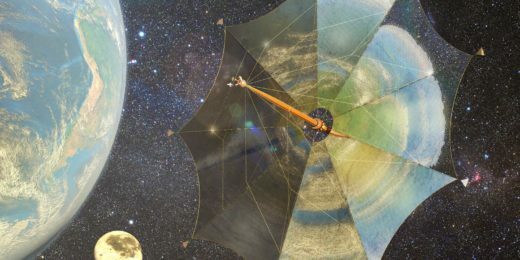 Until about twenty-five years ago, there was still the possibility that our sun was an outsider and that other stars did not have a planetary system at all. But since the first exoplanets were discovered in the nineties, they seem to be all over the place. 3671 were known on 1 October 2017 and new ones are added almost daily. Whenever newspapers, television or social media bring the news about the discovery of another new planet, they usually show a picture. But of course that’s not a photo, because our telescopes are not that good yet. Planets are discovered by small variations in the movements and light of their parent star. So all those beautiful pictures are artist impressions. 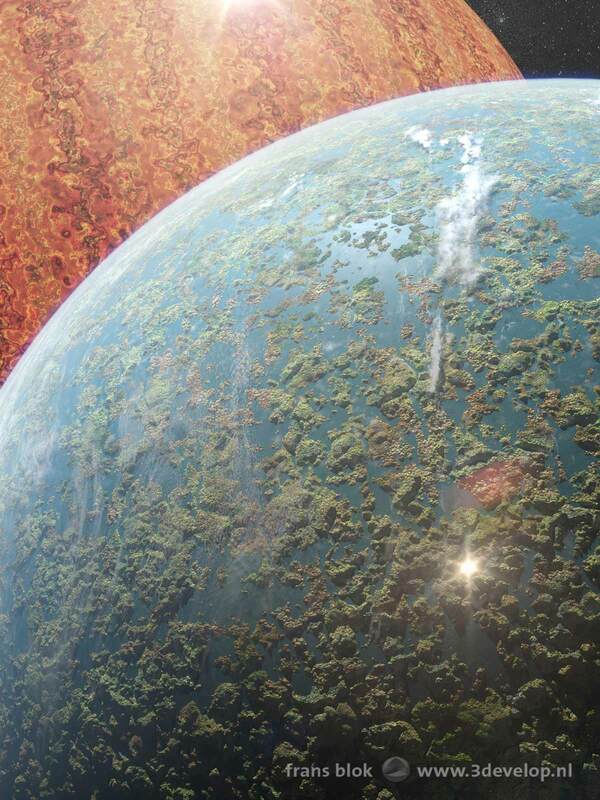 An interesting growth market for impressions artists, so I’ve started visualizing exoplanets as well. On this image we see one of the many Earth-like worlds in our Milky Way Galaxy, officially cataloged as HD 193877d1, but I call her Alice. Earth-like is, however, a relative concept. Astronomers call a planet Earth-like or terrestrial when it has a solid surface, in contrast to gas giants such as Jupiter and Saturn. 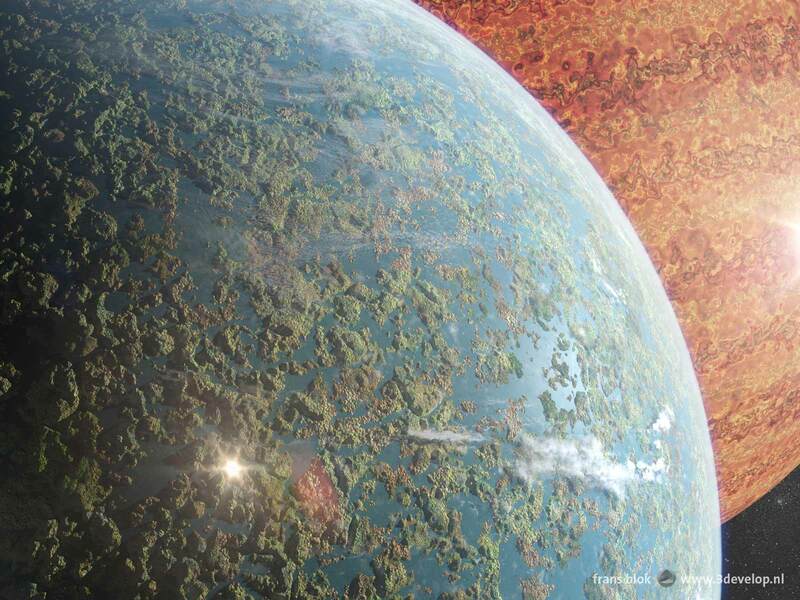 The chances that a planet really resembles Earth are the greatest when it is located in the so-called Goldilocks zone of a star, where it is not too hot and not too cold for liquid water. Alice is in that so-called habitable area and indeed there appears to be liquid water. But unlike on Earth, we do not see large oceans and continents. Here are other geological processes at work than the plate tectonics we know. These processes have resulted in relatively small differences in height. The Alician world map therefore shows a widespread and erratic network of islands, peninsulas and isthmuses, surrounded by a true maze of lakes, bays, gulfs and straits. Formally, Alice is not even a planet, but a moon of the gas giant Goliath. We see that one in the background; it looks somewhat like our own gas giant Jupiter but is more reddish in color. Imagine that, in a distant future, you are part of a research team that is about to explore the planet, pardon moon. What are these interesting landforms? What’s that reflection over there? And the most important question of course: is there life on Alice? Some areas are predominantly green in color, in other places we see more red and brown hues. Are these jungles and deserts or are we thinking to earthly now? We will see. Fasten your seat belts; we are going to land.